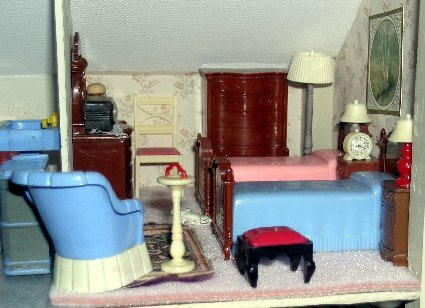 Every time I am tempted to snicker at the oddities that people collect (would you care to see my collection of chamber pots? or do you know that I now have over 3,000 pepper shakers, no salts, all peppers...), I am forced to think upon my own desire to possess miniature dollhouse furnishings. As they say, confession is good for the soul. Well do I know that overwhelming desire to accumulate more and more, and how one smiles sweetly at a fellow collectors possessions while really feeling a nasty coveting jealousy inside. Your eye becomes trained to sweep across displays of antique furniture, iron pots, spittoons, peels and then to stop and focus in on a two-inch high pedestal table or even an one-inch round chamber pot (a 1/2 inch pepper shaker would be a real find). 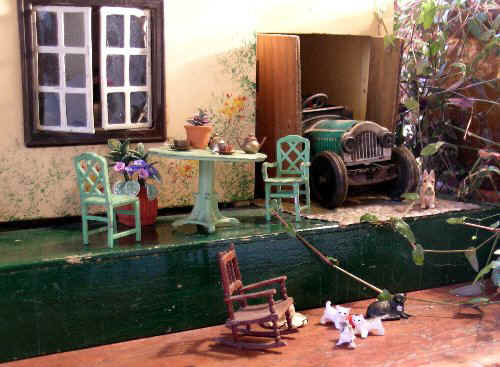 The Enemy is your fellow collector - and I assure you - there is no mercy between miniature-furnishings buffs. The item is carefully tucked away in your wallet or pocket. 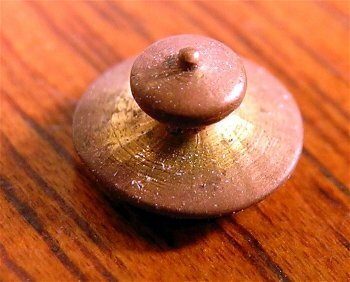 The frustration of a miniature-furnishings buff who can not re-locate his or her purchase upon returning home is a terrible thing to see. Wild thoughts race through your mind and visions of criminal pick-pockets lusting after your 3/4 inch pitcher are dismissed with reluctance. Also, kindly friends restrain you from searching every inch of your path from store to home. With luck, a happy ending, and weeks later you discover it in the cuff of your pants or behind the lining of your purse. Should anxiety arise that a tiny object has fallen in your house, the vacuum cleaner remains silent until the treasure is located. The advantage of this sort of collection is that all styles of furnishings have an appeal at such a tiny scale, while their life-size counter parts may be grotesque in proportion or decoration. The disadvantage is that a whole lifetimes collecting can be contained in one bookshelf. Hardly as showy as a barn full of antique autos or a house full of rocking chairs. 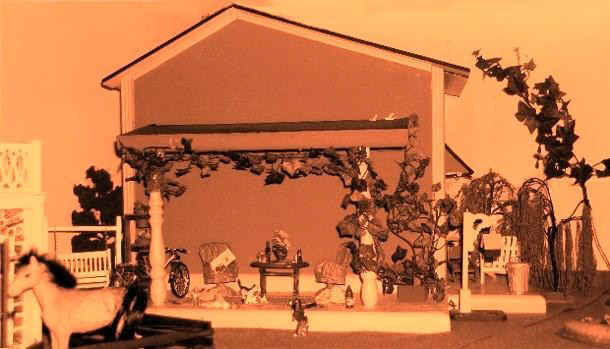 All of this is designed NOT to give you helpful hints on doll house furnishings so that, you will not be tempted to enter this field as a novice and rival. Vintage furnishings from the middle decades of the 20th century are the easiest to collect  old enough to look dated but recent enough to survive in great numbers. Great Finds may be made in thrift and charity shops, as well as antique markets. Today one can buy with ease from eBay and wait with anticipation for the mail person to bring treasures to your door. 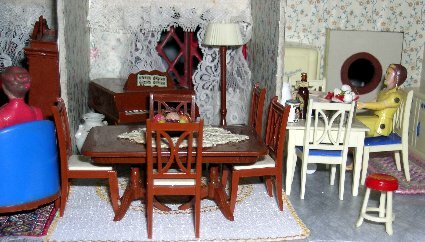 There is a decided advantage in acquiring factory-made items such as a Tomy Smaller House and Garden dollhouse and furnishings from the early 1980s, because missing pieces can be individually acquired to complete a set such as the living room sectional couch or kitchen appliances. In fact, the pursuit and capture of what you dont have may be more luring than the complacency experienced when contemplating what you do own. 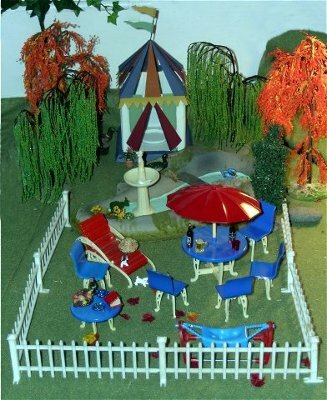 Missing the umbrella from the Plasco Little Homemaker garden set from the late 1940s? Wait and one will turn up on eBay. 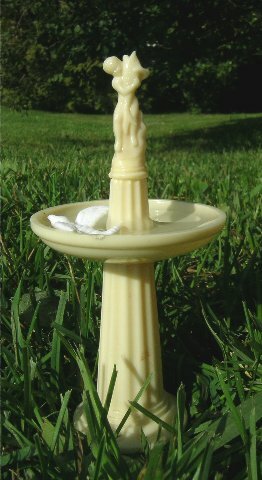 When placed with its pole into the patio table's hole, the resulting set looks as if it had never suffered the indignity of parts having been misplaced. While Tomy items are still plentiful and inexpensive, the pioneers of plastic  Renwal, Ideal and Reliable from the late 1940s and early 1950s are becoming more costly and, if a more unusual pieces such as a sewing machine or carousel, more difficult to locate. That, of course, only serves to whet ones appetite.